Earlier this year, we published a list of the 25 most in-demand skills — like mobile development, channel marketing, and economics. As you may have noticed, all of the skills on the list are “hard skills,” or specific skills required to do a job that can be learned. That’s why we were surprised when recruiters started telling us that they were having a hard time finding people with the right “soft skills,” or personal attributes that help people interact effectively with others – like communication, teamwork and critical thinking. Hard skills vary based on the job, but soft skills are required for every job. For example, a cook must be able to finely dice vegetables, but a server doesn’t. But both must be team players and communicate effectively for the restaurant they work in to succeed. That makes soft skills extremely valuable, and the growing lack of them provides professionals like you with an opportunity to stand out from the pack! That’s why we tapped into the Economic Graph to see what we could uncover on soft skills. Our research led to the development of Master In-Demand Professional Soft Skills — this is a new Lynda.com Learning Path designed to help people learn the most in-demand soft skills. It’s free for everyone for the next 30 days, so check it out! We asked 291 U.S. hiring managers how hard it was to find candidates with the right soft skills for each of the jobs they were hiring for. They said it’s hard to find people with the right soft skills for fifty-nine percent of their open jobs. 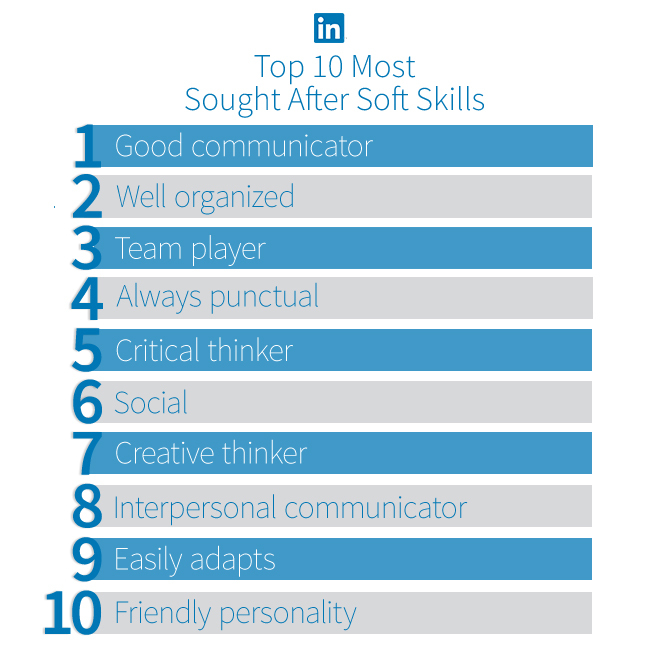 To find the most sought after soft skills, we analyzed the soft skills listed on the profiles of members who job-hopped (defined as a member changing their employer on their LinkedIn profile) between June 2014 and June 2015 to identify the most sought-after soft skills among employers. If you have these soft skills, but haven’t added them to your LinkedIn Profile, add them because they can help you stand out from other candidates. And if you don’t have them, make sure you take advantage of the new Lynda.com Learning Path, to appear more attractive to recruiters. 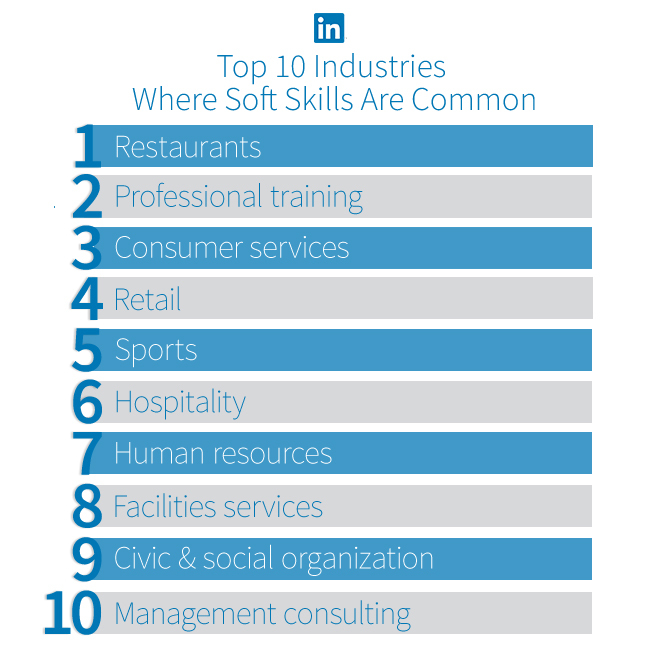 Finally, we identified the industries where soft skills are most and least common among professionals. 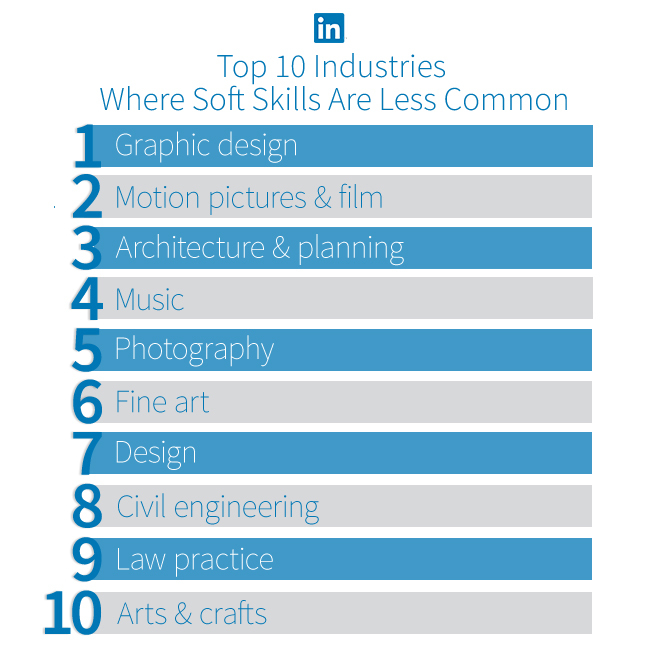 The following lists are good indicators of the industries where demand for soft skills is highest and lowest, and where they are most and least valued. The in-demand list of soft skills derived from a total set of 58 soft skills that were manually curated prior to conducting the research. This list of 58 soft skills contain only raw text strings inputted by members (with minimal corrections applied to typos). So there will be classes of skills that appear as distinct skills, when their meanings could be interpreted to be similar. 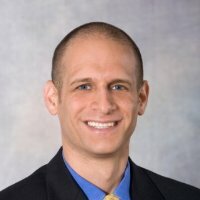 For example, both “interpersonal communication” and “communication” are included in the analysis as distinct soft skills when there’s clearly semantic overlap between the two terms. We don’t make an attempt to group soft skills with similar interpretations, and analyze those member inputted skills “as-is”.